One of the biggest issues I see when people train is missing (or poorly executing) lifts due to a poor set-up. Now this is might be obvious when it comes to big-bang lifts like squats and deadlifts. Let’s take the squat for example: If you’re doing a back squat and your weight is pushed forward and on your toes, you’re not magically going to correct that and find your heels. Instead, you have to fix the set-up and get the feet more balanced from the start to fix the actual lift itself. But while this concept applies to our big lifts, I think we need to remember how important a good set-up is in all of our accessory and supplemental lifts as well. So without any further ado, here are five ninja tricks that I think will make a big difference in your coaching. One of the biggest issues I see when my clients and athletes are doing half-kneeling variations is putting their knee too far back on the pad. In my mental model, I want the set-up to be relatively close to a 90-90 position between the front and back knee/hip, but I want them to feel the whole front foot as well. So here’s the thing – if they set-up with the knee too far back on the pad, their front foot gets too far out in front of the body, and now they lose toe contact. To remedy this, make sure that your clients/athletes always set-up with their knee in the middle of the pad, or slightly towards the front. This will ensure that you can get them into a perfect 90-90 position, with whole foot contact, each and every time. Another common issue I see when people are doing glute bridge or supine hamstring variations is getting too much extension through the lower back. They’re lying on their back, trying to extend their hips, and end up extending through the lower back instead. To fix this, have them start with the knees bent and then work to exhale and tuck the pelvis using the lower abdominals. Once they’re in this position, now ensure that they’re holding this position throughout the course of the exercise. So if they’re doing a glute bridge, they only raise as high as they can while keeping the pelvis tucked and abdominals engaged. The same goes for supine leg curl variations, like the ValSlide leg curl demonstrated below. As you can see in this demo, I actually have E start at the top position versus at the bottom, as it allows him to set-up in a more ideal starting position. Give this a run next time you’re in the gym – it’s a subtle tweak, but one I think will make a big difference in how your clients and athletes feel these exercises! Even though we’re focused mostly on accessory lifts, this next concept (and ensuing video) are applicable almost universally across the board. Let’s come back to the squat as an example: If your client/athlete is doing a set of 5, they’re essentially “setting up” at the top position 5 times. However, when they’re actually going through the set, they’re probably just trying to get through the set – and maybe not as worried about where they’re set up! To remedy this, I often cue my clients and athletes to reset every rep. If you’re back squatting and you have a tendency to get pushed forward out of the bottom, you’ll often end up pushed forward (and on your toes) at the top. So instead of simply trying to squat from this position, make a subtle shift back into a more ideal starting position. Then do your next rep.
Then reset again, and do your next rep.
Once you understand the concept, you can see it applies to a ton of different lifts. On the RDL, make sure your clients/athletes reset, feel the whole foot, and then start to hinge back. On half-kneeling variations where they’ll have a tendency to lean forward, have them shift their weight back and stack the knee/hip/shoulder in a straight line every rep.
Don’t do 1 set of 5 – instead, do 5 sets of 1. It’s such a subtle shift in mindset, but it will make a profound impact on your lifting technique. Another really common issue I see when it comes to poor set-ups is having the hands either in front of, or behind, the shoulders in core training and push-up variations. Take the birddog for example: It looks like such a simple exercise, but when done well, it’s very hard to stay stable and “own” the movement. What I often see is when someone puts their hands back behind their shoulders (closer to their waist), they want to shorten their core and use rectus abdominus to stabilize. If someone puts their hands out in front of them, they really don’t want to reach from the appropriate area. It ends up being a reach through the mid back, or more of a shrug with the upper traps. So this is a really simple fix – when someone is doing a Bear or Birddog, make sure they set-up with the hands underneath the shoulders, and the knees underneath the hips. It sounds easy, but if you do this, it will make a massive impact on how these exercises feel. I know every high-level powerlifter who reads this is probably going to freak out, but I’m honestly okay with that. Arching your back like a “C” from top to bottom may be the best way to move World Record weights, but if you want to lift relatively heavy for as long as possible, you need to be able to squat while keeping the back open. 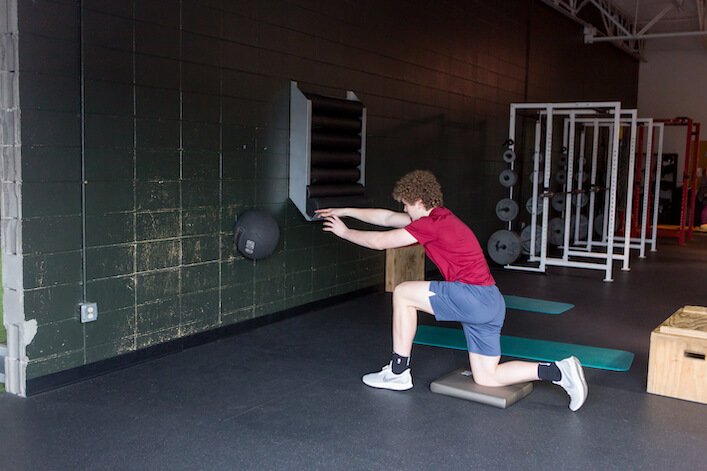 It allows us to maximize our bodies current level of mobility. Now this gets really tricky when you have a barbell on your back, as the natural tendency is to close the back and arch/extend to stabilize. Instead, if you’re looking to open the upper back and re-groove that squat, consider starting with a plate or goblet squat instead. Both of these variations allow your clients/athletes to reach (either through the hands or the elbows), and keep the upper back open. Now a critical piece of the puzzle here is not just getting the reach at the start, but also keeping the reach throughout the course of the lift. It goes beyond just setting up, but it doesn’t make sense to dial in the set-up and then lose the reach when they actually squat! Once you’ve re-grooved the pattern, feel free to start loading using 2-KB front squat or barbell front squat variations, but again, with an emphasis on driving the elbows forward. If you’ve never tried this before, definitely give it a shot the next time you’re in the gym. I think you’ll love how these movements feel! So there you have it – 5 simple things you can do right now, today, to improve your set-up and lifting technique in the gym. Give them a shot, and once you have, report back here and let me know how it went!